Our courses don't end when the school term ends, we carry on teaching through most holidays. During the holiday courses we offer courses to all age groups from small children through to and including Adults. We offer group and one to one courses on things like how to ride a bike through to confidence courses for both on and off road riding as well as our standard Bikeability and National Standards courses. The idea with the confidence courses is that we help you to build your confidence to ride on today's roads or on off road routes. Off road routes include cycle paths, coutnry parks etc. 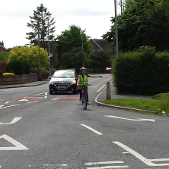 As a recognised Bikeability training provider, Cycle Training Manchester are required to use professional National Standard instructors and operate within Bikeability’s quality assurance system. Bikeability is a quality mark for cycle training, and as a registered provider, Cycle Training Manchester deliver to the highest standards. 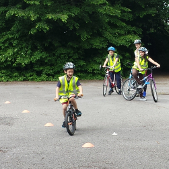 Cycle Training Manchester can deliver on road and off road Bikeability training to groups in schools, clubs, to families or individually to children, adults, new learners and experienced cyclists. We offer courses at central locations and can also come to your school, club or workplace, or meet you for an individual session. There is no upper age limit on training so parents and indeed grand parents are free to join their children if they wish, or come on their own. What will I learn and where are courses held? A summary of our holiday courses is below, more information can be found on our training pages on this website. We train at various locations throughout the North West and can offer bespoke holiday courses if required. For details of our current pre-booked holiday courses follow the links below for details on costs of courses running, or alternatively, please send us an email with your requirements for a bespoke quote. For anyone aged 6+, with seperate grouping for adults. 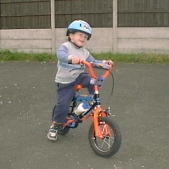 This course is designed to build your bike riding confidence and control skills in a safe environment. For anyone aged 11+, with seperate grouping for adults. 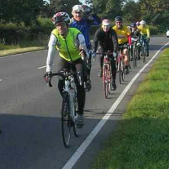 This cycling course takes you out onto busier roads to build your confidence. This builds on the outcomes you learnt on level 2. Aged 8+. 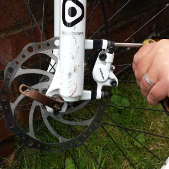 Learn at your own pace how to do everything from basic puncture repairs to full cycle rebuilds. Training is done on your own bike to help maintain it.